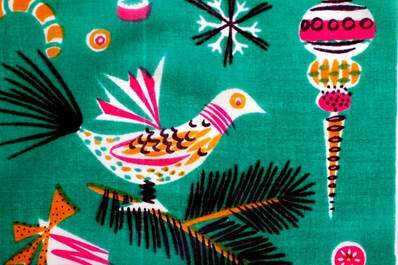 If you’ve read our Hip Holiday review, you know that the hip 50’s jive and swingin’ 60’s cool influenced clothing, furnishings, lifestyles, and even tweaked the traditions of Christmas. Artists adopted a brave and vibrant palette that included zaps of hot pink, zips of turquoise, zings of chartreuse, and a zesty squeeze of lime and orange, topped with a zealous oomph of aluminum. 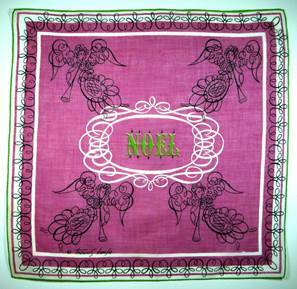 Stores like Neiman Marcus and Lord &Taylor, ever vigilant in the hunt for “new” and “fresh” embraced the hues with gusto. To accommodate a range of consumers, retailers offered the gamut from conservative-with-a-dash-of fun, to all-out-uninhibited. Handkerchiefs were the perfect vehicle to showcase a bounty of selections to suit all tastes and styles, with minimal financial risk to the merchandiser. 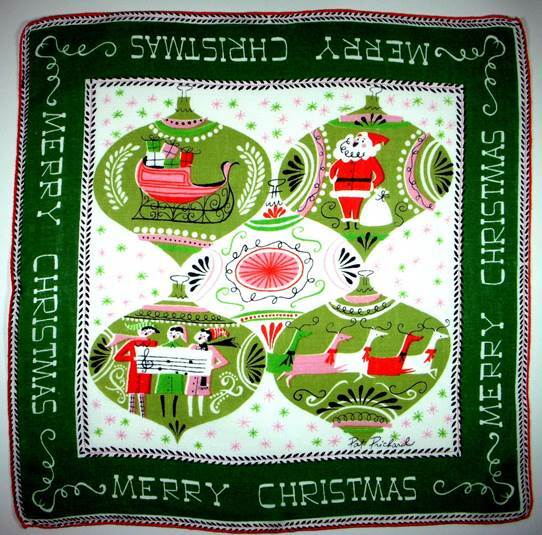 Conservative but Fun – for fussy Aunt Charlotte, who can share a rip roaring good joke once the eggnog has kicked in – we have a quaint Victorian scene, with snow falling from a charming pink sky, while blue-green holly leaves dance around the festive border. It’s a beautiful, bountiful sleigh, packed and ready for a midnight ride. But where is Santa? Uh-oh. 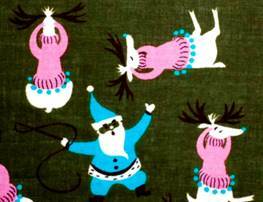 He’s doing his best to round up the rowdy reindeer. Our fashion-forward furry friends flaunt pink and turquoise sweaters trimmed with ball fringe, and let Santa know they’ll harness up when they’re good and ready, thank you. 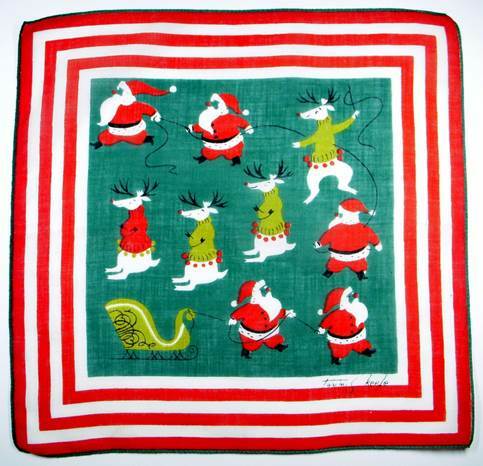 Did you ever think you’d see Santa in turquoise? 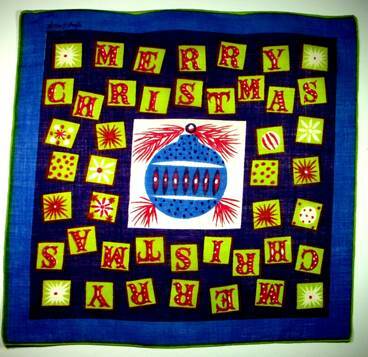 Or a holiday hankie bordered in brilliant blue stripes? This was definitely a new era, a new vibe, a new energy, and aluminum trees led the parade. 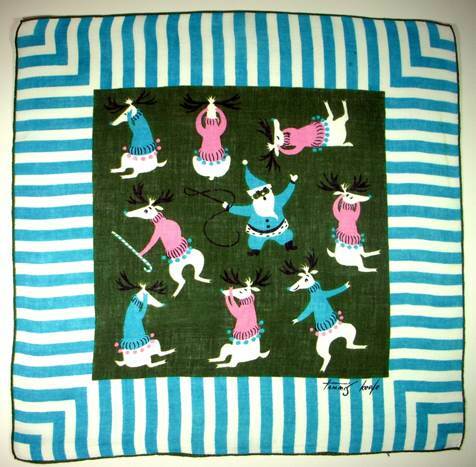 Once those antlered pranksters kick into gear, watch out. Soon they have Santa pulling his own sleigh, thank you very much. And hop to it, little man! 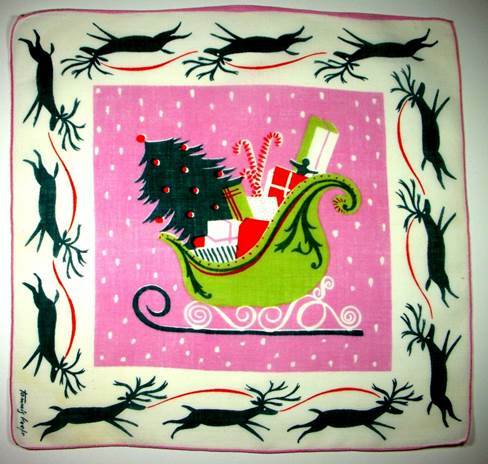 Brilliant spring green on a Schiaparelli pink background with a caramel golden sleigh make for a fun joy ride. 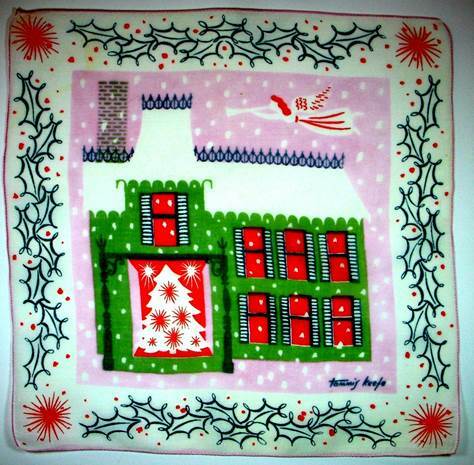 Who wouldn’t want to receive one of these hankies in their stocking? Keefe is a master artist, pure and simple. Note how she even changes up the striped border. The fresh turquoise stripes meet at crisp right angles, looking look fresh and dazzling for any winter sojourn in Palm Beach or peeking from a pocket aboard an ocean cruise. 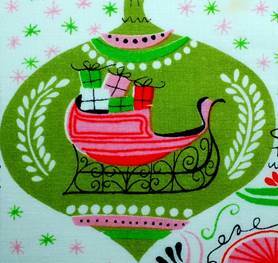 The Grosse Pointe “pink & green” (insiders will get the reference) and the curlicues on the sleigh are a bit more traditional, but the rowdy “do it yourself” theme and color combo pop everything into a new dimension. 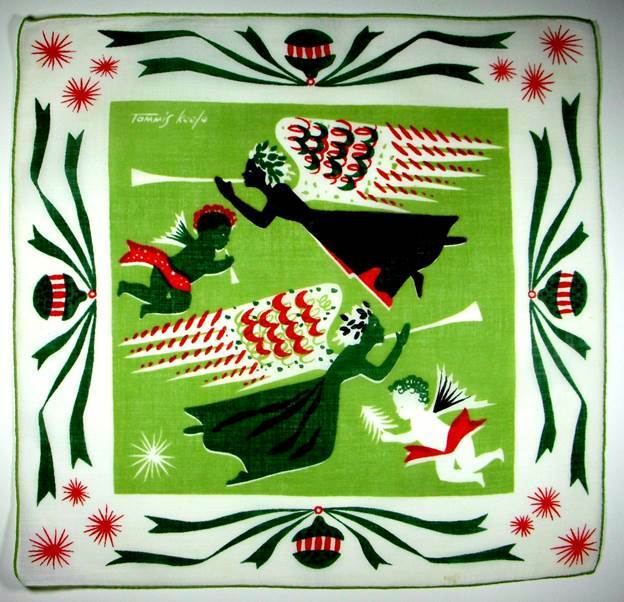 For you traditionalists, Keefe offers a compromise – traditional red and green, with a zesty burst of chartreuse splashed on the sleigh and sweaters – a hankie for the granny who enjoys a spirited sequin-clad Saturday night on the town, yet appears bright and early Sunday morning in sedate gloves and a strand of pearls for church services. 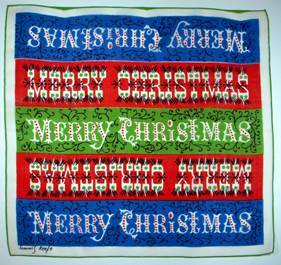 A few more “slightly bold” hankies wish you Merry Christmas in lime green and bright blue, but the choice of type font says old world tradition all the way. Yes, it’s a brilliant red snowflake, but we’re still minding our manners and staying within the borders of decorum. 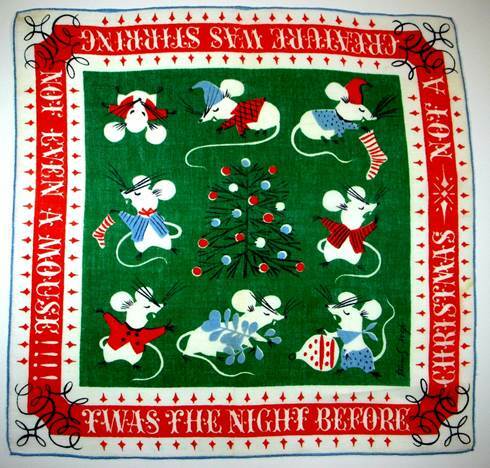 Even in traditional hankies, however, you can find a pop of something unexpected, as in this Night Before Christmas number, where not a creature is stirring, except a few unruly little mice! The use of icy winter blue is completely unexpected, particularly when it comes to mistletoe. And can’t we all relate to that darling little snoozer in the red jacket? Having put in a full day of frazzled frolicking, the poor little trooper is down for the count. Ice blue appears once again, this time paired with a whimsical couple floating in a hot pink Paris sky. 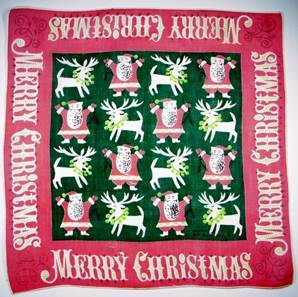 The same dazzling pink replaces traditional red in the second hankie which features a corral of Santas and reindeer sporting lime green jingle bell collars. Both images are celebratory and lighthearted – a perfect subject match for brilliant hot pink. 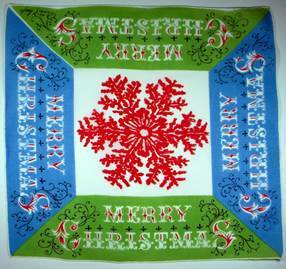 Traditional evergreen borders and backgrounds anchor these hankies to the Christmas season, yet the blue stars and pink evoke romance as much as Happy Holiday. 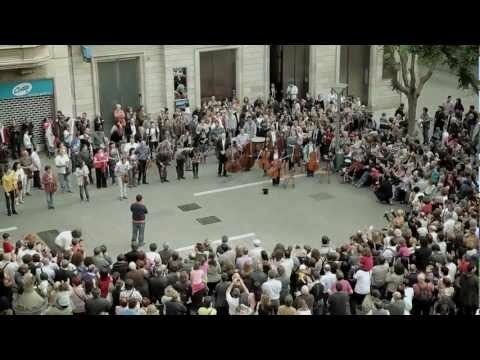 The darling tiny hearts anchoring the corners underscore the feeling of l’amour. Silver Bells, Silver Bells….. Uh, I don’t think so. 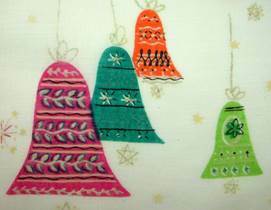 Fresh and flirty bells are anything but traditional as they don the colors of a Hip Christmas – pink turquoise, vibrant green and spicy orange. The feeling is engaging, enjoyable and entertaining. So too, a simple landscape of trees depicts shrubs in dark blue as well as bright orange. We may retain our traditional images, but we’ll certainly add crackle and sizzle with fizzy colors. These charmers go all the way, forsaking any traditional Christmas colors, yet heralding the Holidays with every sweep and swirl. 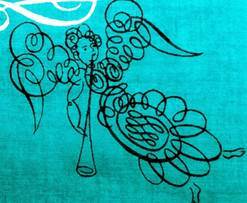 One in turquoise and pink, one in magenta and lime, these fanciful, curlicue Cherubim and Seraphim proclaim Rejoice! Rejoice! 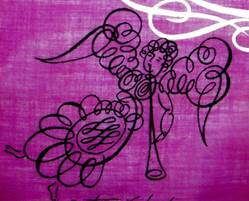 These divine and fanciful angels manage to be both childlike and sophisticated simultaneously. 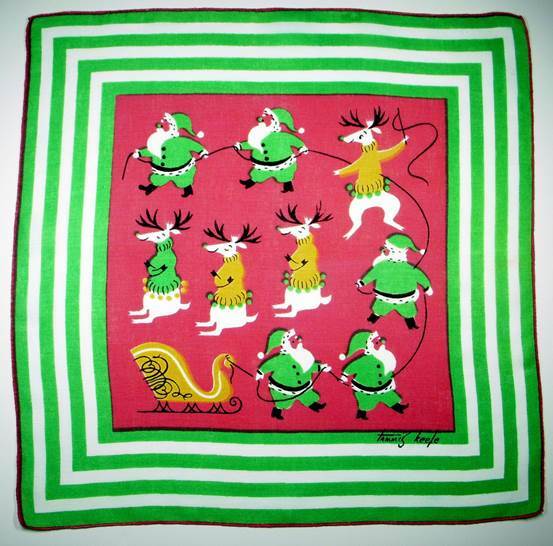 Who wouldn’t want to find one of these hankies in their stocking Christmas morning? 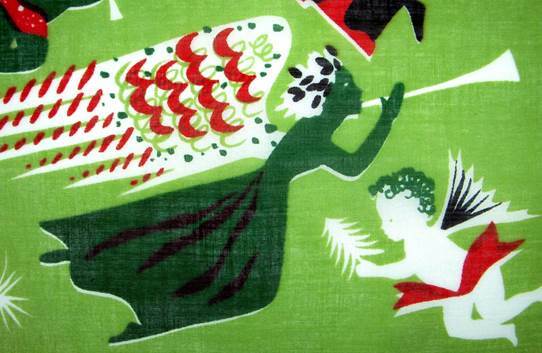 I’m Dreaming of a Lime Christmas…. 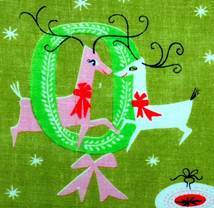 Artist Pat Prichard may have allowed Santa to retain his jolly red suit, but his sleigh is now pink, as are some of the reindeer, as well as carolers in the snow. 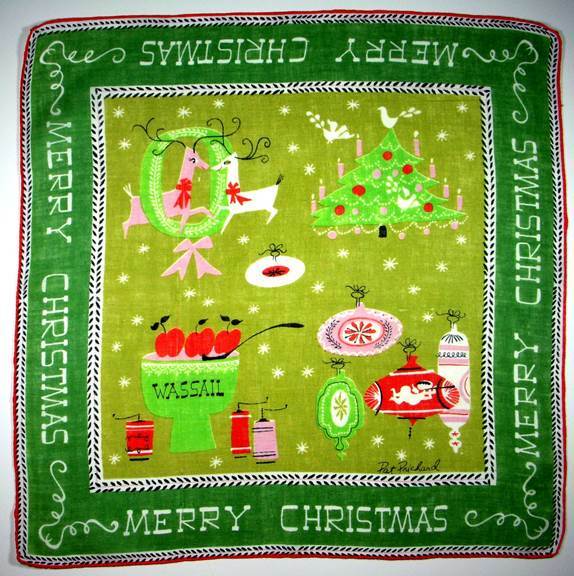 Each holiday scene is affixed to a lime green ornament – fun, fresh, and oh so jolly. 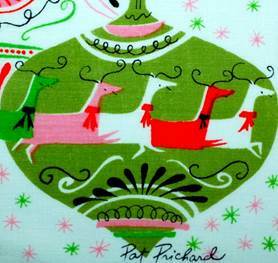 The forest green border anchors us in tradition while giving a tip of the hat to the fun that was the fabulous fifties. Here she goes again, this time with ornaments, trees, smooching reindeer and the traditional mulled cider – Wassail. 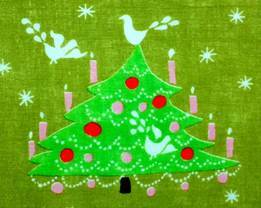 The green border and crisp red apples sing Merry Christmas all the way, but the chartreuse background, with pops of pink and lime green say Cool Yule and a Hip New Year. The pink candled Christmas tree feels almost like a birthday cake and nuzzling reindeer are très modern. Another lime green beauty sports angels with bouffant coiffures comprised of olive leaves. One angel is depicted in black silhouette, a stark contrast with the lime green background. It’s simply fabulous, and denotes sophistication and celebration on the highest order. The large expanse of angel wings and fluttering streams of ribbon on the borders anchored with stars is as crisp and contemporary as anything created today, although it’s at least 60 years old. Minimum strokes, maximum impact -the mark of a consummate commercial artist. Bursts of orange and pink in this traditional tableau bring everything to life. All is flirty, fanciful and fun. Old fashioned ribbon candy and paper garlands feel fresh and new in nutmeg and magenta. The images are timeless; it’s the colors that set the tone, and chide us to “get with it” via a tangy orange candy cane and shocking pink stocking. Closer inspection of the details shows us a bird adorned in magenta, purple turquoise and orange, yet he fits perfectly into the overall scene. 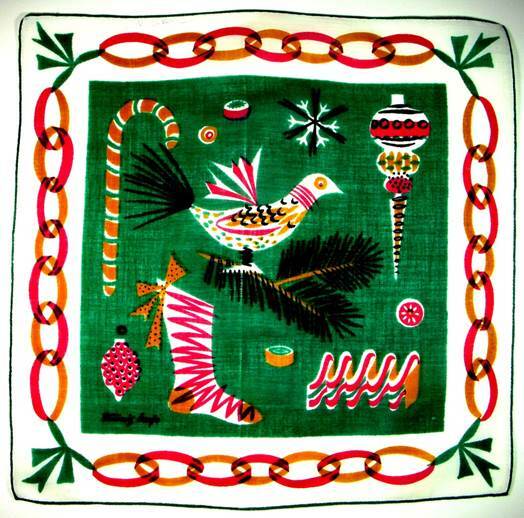 No shiny silver plumed partridge could spell Christmas with any more authenticity than this little guy here. 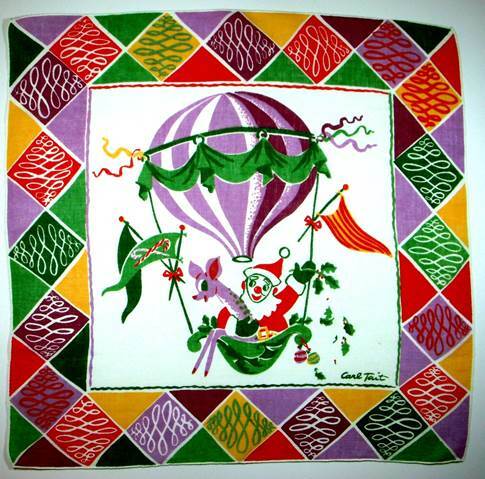 More gold, deep maroon, and exotic lavender combine to form a harlequin backdrop to this Carl Tait image of a Santa who traded his sleigh for a hot air balloon. A once-in-a-lifetime lavender Rudolph looks mighty happy to be along for the ride. The artist gave himself free rein and had a ball with this. 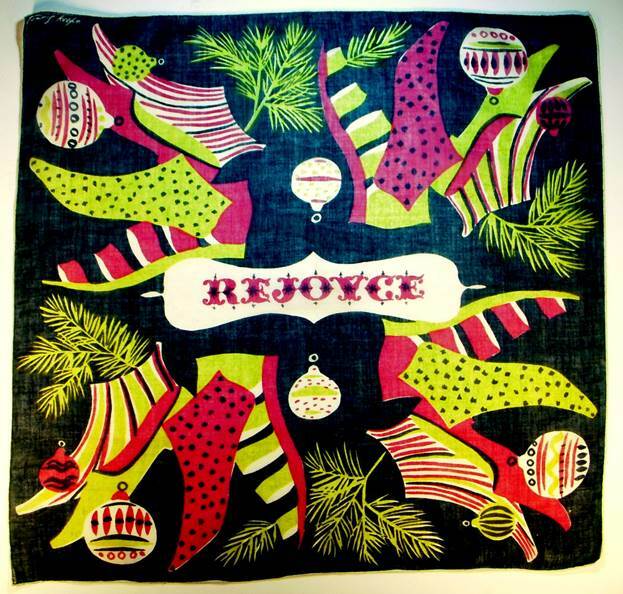 It reminds me of the innovative covers that always adorned the Neiman Marcus Christmas catalog. In fact, it seems to me an image somewhat like this may have appeared there one year. Aside: Stanley Marcus was a master merchandiser and if you’re into customer service, his book Minding the Store is a great read. His other books Quest for the Best and His and Hers provide insight into a remarkably talented, creative, brilliant mind. I met him in person on a few occasions, once while waiting in line for him to sign his book. I, too, am a published author, and when he learned that, he shared this sage advice: “Always personalize the dedication with the recipient’s name” he counseled. Just as I was thinking to myself ‘That’s so like him, always adding the extra touch”, he grabbed my hand and added with a sly wink “That way, they can never return it!” Oh Stanley. Ever the merchandiser…. We both had a good chuckle. It doesn’t get much sillier than this. Soon these wild and wooly stocking will be “hung by the chimney with care.” Or maybe not…. Perhaps they’ll join Woody and Buzz Lightyear and frolic through the night while the rest of the world sleeps. 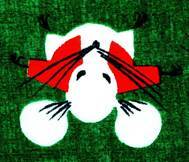 Some remind me of impossible yoga poses I’ve attempted before collapsing in a heap. For you dancers in the crowd, note the lavender socks forming the letter “T”. They obviously belong to a ballerina who was standing in fifth position right before she slipped out of them. The adorable little green “i” dot, the teensiest sock of the bunch, winks back at you over his gaily stripped stem; while the yellow and orange polka dot “N” makes you want to grab this pair and boogie ‘til you drop. 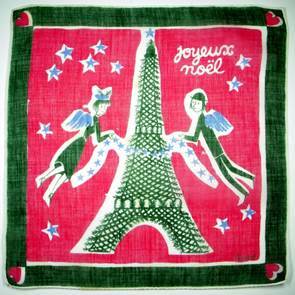 Truly, you can’t help but be joyful when carrying this hankie. Colors run the gamut from cinnamon to purple to burnt orange – definitely not your traditional stockings, but oh what fun. And isn’t this exactly what socks look like tumbling and twirling in the dryer? 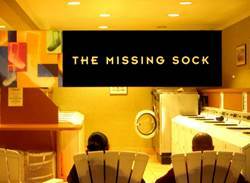 Aside: Next time you’re in San Francisco clacking up and down the hills on the Hyde St. cable car, keep your eyes peeled for a wee little Laundromat aptly named “The Missing Sock.” Now you know where they all went! When the cable car whizzed by, these jolly pranksters hopped aboard for a joy ride. The establishment is fresh, and charming. You sit and read in faux Adirondack chairs while your clothes dance themselves dry, and trolley bells clang in the background. Note their logo – a collage of “single” socks. (Seinfeld does a great routine on the missing sock.) 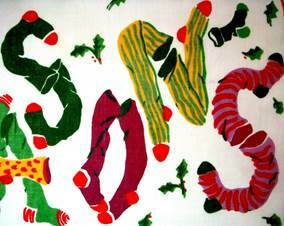 Most folks I know have at least one pair of Christmas socks so perhaps Tait was on to something. Once you’ve donned your crazy socks, you’d better have some toe-tapping shoes to complete your ensemble. Check out this cheerful “kick up your heels and dance” number. The forest green background is so deep it’s almost black, showcasing a mad array of shoes in every style and shade from citrus green, to chartreuse, shocking pink, ruby red, and more. Carrie Bradshaw, eat your heart out. And note the spelling of Rejoyce – delightful! 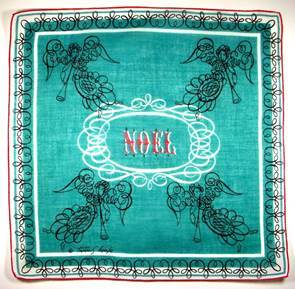 The traditional ornaments, sprigs of greenery, and old style type font assure us that indeed, this hankie still part of a grand tradition, and ‘tis the season to make merry. These jolly shoes must be on their way to a fab celebration, and we want to join them. 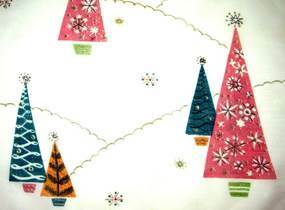 So whether you’re a traditionalist who loves a soft hankie embroidered with a Sweet Santa, or a throwback to the 40’s when hankies were printed with masses of poinsettias, or you’re ready succumb to a tinsel tree of fabulous 50’s – do enjoy your holiday, with all the magic and miracles it has to offer for you and those you hold dear. These images are incredible that you have here. Your collection is amazing. Merry Christmas. 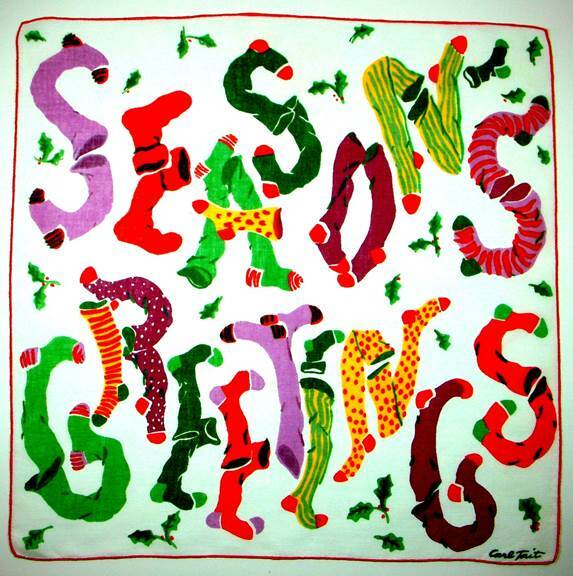 Great holiday designs-I love them all! 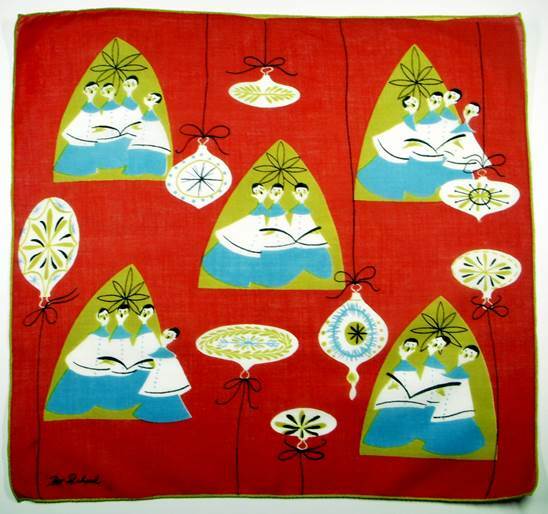 Wow…I’m so envious…do you own all these hankies? Love them!